It's crunchtime for NASA's MarsReconnaissance Orbiter, a massive spacecraft bearing down on the red planetfor a March 10 arrival after seven months of spaceflight. The orbiteris set to fire its thrusters at 4:25 p.m. EST (2125 GMT) Friday in a maneuverthat, researchers hope, will put MRO in orbit around Mars to study the planet'satmosphere, water history and identify landing sites for future missions. "Themission is entering a very dangerous phase for the next several days," said FukLi, NASA's Mars exploration directorate chief at the Jet Propulsion Laboratory(JPL) in Pasadena, California. "We've sent four missions that we intended toorbit Mars [in 15 years] and only two have succeeded...for us those aresobering numbers." MRO isexpected to conduct a 27-minute thruster burn to place it in an ellipticalorbit around Mars. Flight controllers will be in contact with the spacecraftfor the maneuver's first 21 minutes before MRO swings behind the planet'ssouthern hemisphere to complete the orbit insertion burn. The spacecraft isexpected to reestablish contact with Earth at 5:16 p.m. EST (2216 GMT), missionmanagers said. "For thelast six minutes we are essentially in white knuckle time," said James Graf,MRO project manager at JPL, during a Wednesday press conference. "If we don'tget several of those last minutes, we will not be able to get into Mars orbit." But so far,the $720 million MRO mission has performed flawlessly. The probe's310-million mile (498-million kilometer) flight has been so precise since itsAug. 12, 2005 launch that flight controllers cancelled the last two of fourplanned course corrections, saving precious fuel for the orbiter's mission inMars orbit, Graf said. Its Optical Navigation Camera, a new imager designed tocompare Mars' two moons Phobos and Deimos with background stars to determineMRO's position, has already proven itself useful and achieved one of severaltechnology demonstrations slated for the mission, he added. MRO willjoin two other NASA orbiters - Mars GlobalSurveyor and MarsOdyssey - currently circling Mars, as well as the space agency's Spirit and Opportunity roverscrawling across the planet's surface. 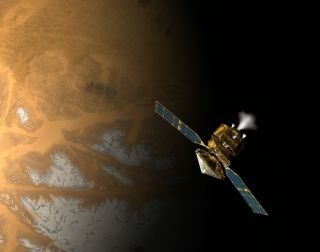 Europe's MarsExpress probe is also orbiting the planet. But MROoutstrips all three orbiters in size and camera resolution and is expected tolay the foundation for future Mars missions. "We'rebringing more capability to the planet," said Richard Zurek, MRO's projectscientist at JPL, adding that the probe's science package will help researcherslearn more of the water story on Mars. "What we're really doing now is establishing the backgroundenvironment that we have to deal with when we plan future missions." MRO carriessix primary instruments to study Mars, including the High-Resolution ImagingScience Experiment (HiRISE) camera that can collect more data in a single imagethan NASA's twin Mars rovers senthome during their first 90 days, mission managers said. During its two-year science mission, subsurface radar will probe for undergroundwater and ice, while other instruments hunt for water-related minerals andstudy the Martian atmosphere. A suite of three cameras will also pick outpotential landing sites for future spacecraft. Normalscience operations will begin this fall after MRO completes about seven monthsof aerobrakingmaneuvers, which use atmospheric drag to slow and shape the spacecraft's orbit,to reach its final orbit, mission managers said. The first of 550 aerobraking passes is scheduled for later this month, and each pass will allow researchers to map the density of the Martian atmosphere, they added. "There are wavesin the atmosphere just like there are waves in [Earth's] ocean," Zurek said. "Knowing about these variations helps us plan our aerobraking process." NASA willbroadcast a pre-orbit insertion MRO mission briefing on NASA TV at 12:00 p.m.EST (1700 GMT) on March 10. Live coverage of MRO's Mars arrival begins at 3:30p.m. EST (2030 GMT). You are invited to follow the mission's progress via SPACE.com'sNASA TV feed available here.